'90s alternative rock is the best kind of rock out there. The epitome of this is acts like The Beastie Boys and The Offspring, and of course The Smashing Pumpkins. Billy Corgan with hair is a weird sight nowadays. D'arcy is strung out of her mind, and Billy can't even wrap his head around that piano solo the guy from the other band plays. The look on his face is basically "cool thanks I guess". What a great group. 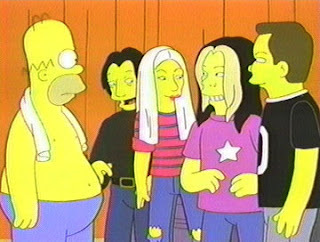 Oh, and they had a really cool guest spot on The Simpsons back when that was good too.